Philips is the world’s first to present a lamp prototype that produces a record 200 lumen per watt (lm/W) of high quality warm white light. This LED technology breakthrough brings energy-efficient LED light suitable for general lighting applications to a whole new level. The 200lm/W LED is expected to hit the market in 2015 and will ultimately be used in a wide range of applications. In the industry’s effort to break the 200lm/W barrier, the challenge is to achieve higher efficiency levels at lamp/system level (demonstrated in an end product prototype under real, normal conditions and ready to be incorporated into actual products). Until now, similar efficiency levels have been achieved in a cool and controlled lab setting or on component level, however, when placing the solution in a lamp it could lose up to 50% of its efficiency. Furthermore, to be suitable for real-world applications, the light produced by LEDs must fall within certain technical parameters. If it is too cool or too warm in color, or lacks a sufficient quantity of red, it will interfere with the way the human eye perceives color, and will give objects an unnatural tint. Yellow/green emitting LEDs obtained by phosphor conversion, for example, are extremely energy efficient (providing more than 380lm/W), but practically useless for general lighting purposes. In technical terms, general lighting applications require a color temperature of 3000–4000 kelvins, a color rendering index of at least 80, and an R9 (level of saturated red) of no less than 20. It is within this context that the magnitude of Philips’ achievement must be understood. Philips’ TLED protype produces 200 lm/W without scarifying color rendering index and staying on the black body line. How are white LEDs created? There are currently two ways to make white light with LEDs. One method mixes multiple wavelengths of different LEDs to make white light (i.e. RGB); allowing the lighting designer to tune the white light to a specific color temperature. The second method uses a blue Indium-Gallium-Nitride (InGaN) LED with a phosphor coating to create white light. This is the method that results in the more commonly seen “white LED”. At the heart of this TLED is Philips Lumileds InGaN LED, recognized as the world’s highest performing blue LED. This LED significantly boosts efficiency from the earlier generation which was at the heart of the L Prize (see below) winning replacement 60W bulb. This LED innovation introduces tremendous potential for lowering energy consumption for lighting by halve. Until now, the relative energy efficiency of fluorescent lighting (100lm/W) has seen it dominate in office and industrial environments. Homes and shops, meanwhile, have tended to stick with the gentler, warmer light produced by conventional bulbs (operating at around 15lm/W) or halogen lights (25lm/W). 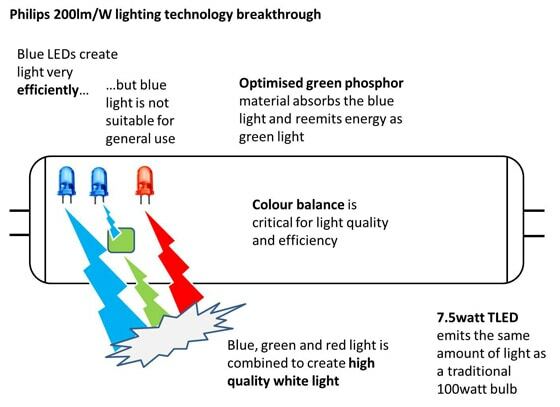 Philips’ new 200lm/W LED, however, leaves all three technologies in the shade. Vastly more energy efficient than incandescent and halogen lighting, LED can drive down energy bills. The most significant implication of the new LED, however, is that it can finally unseat fluorescent lighting as the most energy-efficient technology for general lighting applications. The 200lm/W LED uses only half the energy of a fluorescent tube, and given that the latter account for more than 50% of the world’s total lighting, transitioning to LED will drive staggering energy and cost savings. In the United States, for example, fluorescent lights consume about 200 terawatt-hours (TWh) annually. If these lights were all replaced with 200 lm/W LEDs, the US would use around 100TWh less energy – saving more than US$12 billion and preventing around 60 million metric tons of CO2 from being released into the atmosphere. Repeating these savings all around the globe, clearly shows the scale and the immense impact of this innovation. As an added benefit, the new LEDs generate less heat, so they can be made without heat sinks. This means they are less bulky, give greater design freedom, use less material and can be produced more cheaply. 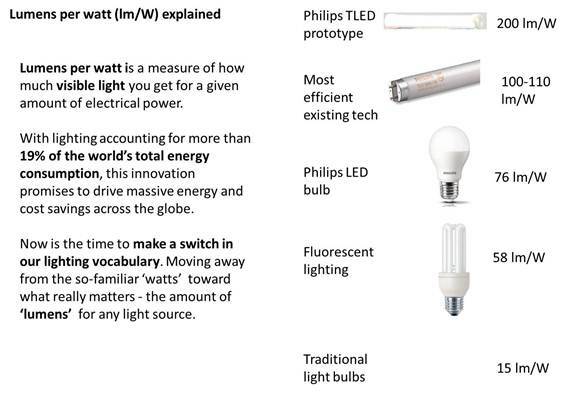 The LED research team takes its place in a long tradition of meaningful innovation at Philips, stretching back to when the company first brought Edison’s light bulb to the market more than 100 years ago. By finally offering a superior energy-saving alternative to fluorescent tubes, the 200lm/W TLED represents a momentous step towards significantly decreased energy consumption worldwide. In 2011, Philips was selected as the winner of a U.S. Department of Energy competition to replace the common light bulb. The competition, launched in 2008, challenged lighting manufacturers to push the limits of energy efficiency and develop a high quality solid state lighting product to replace the common incandescent bulb. In October 2012, Philips unveiled Hue, the world’s first and smartest web-enabled LED home lighting system on the market. Philips Hue allows you to create and control the light using your smartphone or tablet, allowing you get creative and help you personalize your lighting to suit yours and your family’s lifestyle. Philips has opened up the Hue app to the developer community and has created an open source platform at www.meethue.com inviting developers to explore the app and unleash even more possibilities. Royal Philips Electronics (NYSE: PHG, AEX: PHIA) is a diversified health and well-being company, focused on improving people’s lives through meaningful innovation in the areas of Healthcare, Consumer Lifestyle and Lighting. Headquartered in the Netherlands, Philips posted 2012 sales of EUR 24.8 billion and employs approximately 118,000 employees with sales and services in more than 100 countries. The company is a leader in cardiac care, acute care and home healthcare, energy efficient lighting solutions and new lighting applications, as well as male shaving and grooming and oral healthcare. News from Philips is located at www.philips.com/newscenter.